When should orthodontic retainers be worn? Retainers are most important immediately after orthodontic treatment. In the first few months after braces are removed teeth have the highest tendency to move to an unwanted position. After a few months (typically 2 to 4), the bone and gums around the teeth become more stable and this tendency for relapse decreases. This tendency never goes away completely, however, so we recommend that a retainer still be worn occasionally—typically just at night or a few nights a week. Everyone’s teeth are different, however, and when your orthodontic treatment is complete Dr. Berkman or Shapiro will review with you what type of retainers are recommended, why, and how they should be worn. All teeth that have been straightened with orthodontic treatment have a tendency to relapse somewhat to their original position. In our office treatment is individualized so that this relapse tendency is kept to a minimum. It is always there on some level, though, and retainers are used to stabilize teeth in the positions where we would like them to remain. Retainers are not always recommended after orthodontic treatment however. Following developmental treatment in growing children who do not yet have all adult teeth, for example, retainers are typically not used so that the teeth are allowed to drift a bit and allow the adult teeth can erupt in the most healthy way. Can a retainer be used to straighten my teeth? Typically, no. Retainers are designed to do just that—retain. They are used to hold the correction that has been made, so that the benefit of your orthodontic treatment remains long after you are done with braces or Invisalign. What if I forget to wear my retainer? Forgetting to wear a retainer is not a cause for alarm or an emergency. If a day or even a few days go by, gently re-insert the retainer because it may initially feel tight in certain spots. This is normal and indicates that the retainer is working—helping to realign and hold your teeth where they ought to be. At this point, we recommend you continue to wear your retainer full-time until your teeth are once again retained in the right spot. If for some reason you forget to wear your retainer for a longer time, revisional treatment may be necessary to restore your teeth to their original positions. Remember, our goal is to help your smile stay beautiful and healthy for a lifetime. Your cooperation is essential for this! Retainers should be cleaned daily with a toothbrush, just like teeth! Toothpaste is mildly abrasive, so we recommend liquid soap be used instead. Please remember to brush your retainers after you take them out, or at least once daily if you are currently wearing them full-time. A denture cleaning agent, such as Efferdent, will aid in the removal of tartar. Be sure to rinse the retainers thoroughly after cleaning to remove any cleaning residue. Retainers are typically made from an acrylic or thermoplastic material that is sensitive to high heat, so they should be kept away from hot car dashboards, dishwashers, ovens, and other heat sources. When not being worn, retainers should be kept in their proper retainer case and in a safe place. As Drs. 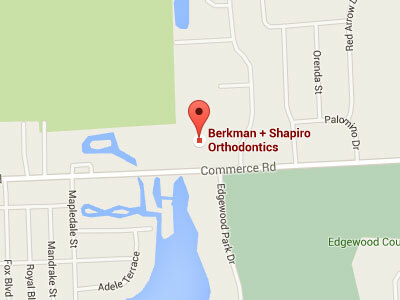 Berkman & Shapiro say, “In your face or in the case!” This is especially important if you have a pet, as dogs and cats love to find and chew retainers. Retainers, much like eyeglasses, have a limited life. At certain intervals they do need to be replaced. We are happy to evaluate your retainer at any point to let you know our recommendations. Just give us a call!